With its infamous nickname, “The Boulevard of Death,” Queens Boulevard is one of the longest and most perilous roads in the borough. Activists and residents of Forest Hills are pushing the Department of Transportation to re-engineer the road for pedestrian safety. Queens Boulevard connects the neighborhoods of Long Island City, Sunnyside, Woodside, Elmhurst, Rego Park, Forest Hills, Kew Gardens and Briarwood. Over 10 to 12 lanes wide and 16 lanes at the intersection with Yellowstone Boulevard in Forest Hills, Queens Boulevard has retained its bad reputation as an unpleasant traffic route for number of years. The most recent Police Department records show 26 collisions with injuries in February, in Forest Hills’ 112th Precinct. 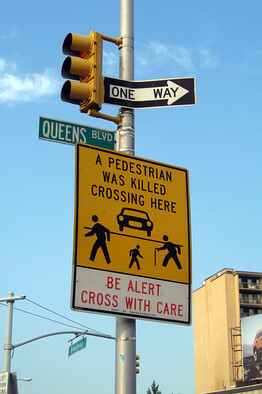 Beadle said that Queens Boulevard is a danger to all, especially students and elderly. The main issue, according to Beadle, Hannus and the rest of the members at Community Board 6 is that the Department of Transportation is not taking action to redesign Queens Boulevard.. The city has no current plans for Queens Boulevard, according to the Department of Transportation’s on-line list of current projects. “What’s preventing the Department of Transportation from acting is that it is a big problem,” said Beedle. “As population rises, more has to be done to assure our safety. It is so important to get your support,” he told the board. According to Transportation Alternatives, between 2002 and 2011, 890 pedestrians and 205 cyclists have been injured on the street and 17 pedestrians and two cyclists have been killed. The Zero Plan has collected 3322 petition signatures to date, along with the support of 194 coalition partners from schools and religious organizations, 171 businesses and five council members. Advocates believe the plan will allow every pedestrian, cyclist, and driver to know where they belong on the lanes. 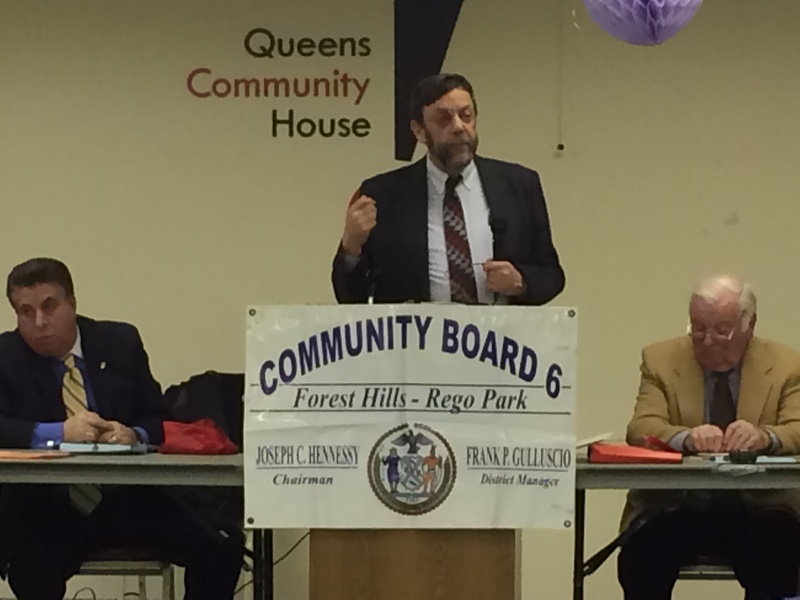 Forest Hills residents also spoke up on the present and future of Queens Boulevard. Phyllis Wallace, who waits for her Access-A-Ride daily near Queens Boulevard, said she heard of an accident a few years ago and hopes the city will act on the plan. Norma Cruz and Amy Guarino, who work along Queens Boulevard and in the Queens Center Mall, said they cross two to three times daily. “I always feel scared while crossing. So I’m always alert,” Guarino said. Andre Williams, a student at Queens Community College, pointed out a problem with the traffic lights at Queens Boulevard and 63rd Drive. “No matter what we do, the drivers also have to stop using cellphones and the pedestrians have to open their ears,” said Joseph C. Hennessy, chairman of Community Board 6. On the last day of the fourth semester of the school year, two juniors sat by the corner of Forest Hills High School’s lobby discussing their trigonometry homework. The two unfolded their notebooks and crunched numbers on their calculators. Their half-opened JanSport book bags revealed neglected SAT practice books. Yifan Yang and Wei Lin, both aiming to attend Cornell or New York University, are two of the many students in Forest Hills struggling to balance schoolwork with preparation for one of the most important tests of their lives. Now, changes in the widely-used college admission test, the SAT, is provoking debate among students and their teachers in Forest Hills. The SAT, created in 1926, has undergone many changes for junior or senior class to admit into colleges and universities across the country. Recently, it has taken another turn in reflecting high school curriculums and common academic skills. The redesigned test will actually distribute to students in spring 2016, with drastic changes in its format. The essay will become optional; there will be no penalty for wrong answers; simple everyday vocabulary words will replace abstruse vocabularies; and students will be prohibited from using calculators on math problems. “They make us buy the expensive Ti-84 calculators and teach us how to use them, but now all that knowledge and money will be thrown out the window, because we are on our own during SAT,” said Kevin Roman, a freshman who will most likely take the new test in 2016. The math and English teachers at Forest Hills also have mixed opinions. Charles Chiang, a math teacher from Taiwan, who has taught trigonometry in Forest Hills for 30 years, feels passionate about the issue. Twenty years ago, the College Board began allowing the use of calculators on the math section. Now the 2016 version will take away the tool. English teacher Walter Fishkind believes the new test will relieve some of the stress students feel, but his colleague Daniel Hovsepian thinks otherwise. For many students, the issue is simple: will they score higher on the redesigned test than the current version? Angry at the piles of slush at bus stops and slippery steps at subway stations, members of Community Board 6 blasted the Sanitation Department’s failure to follow through after the series of snow storms that hit the city this winter. 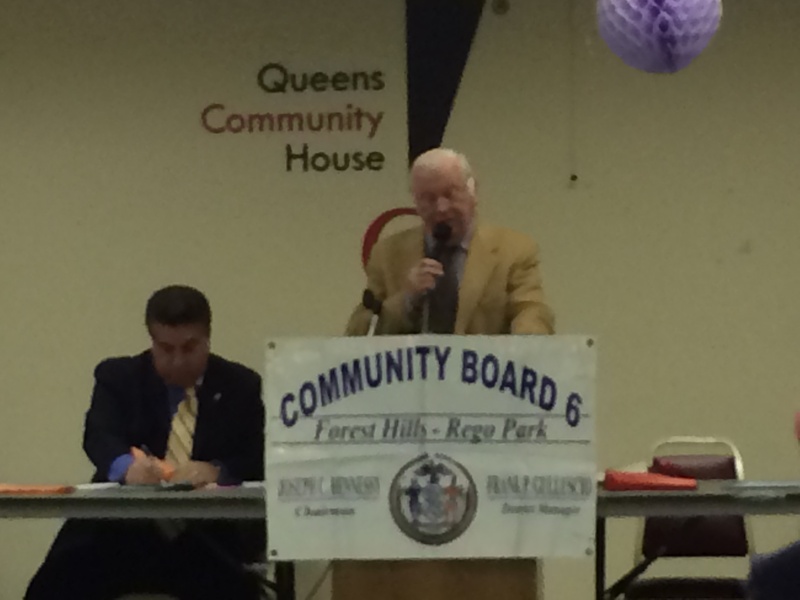 At its February meeting, members of the audience and of the board, which represents Forest Hills and Rego Park, complained that conditions on local streets endangered senior citizens in particular. Chairman Joseph C. Hennessy stated in his Chairman’s report that Department of Sanitation has done its best at cleaning up the snow during the multiple snowstorms over the few weeks. His major concerns were the piles of ice and slush by the bus stops, slippery and wet subway stairs and the safety of senior citizens when they have to walk across the icy curbs to another intersection. District Manager Frank Gulluscio praised workers employed by the nonprofit Doe fund for shoveling out corners. The fund employs formerly homeless people, addicts and parolees to perform public service. It is responsible for clearing snow from pedestrian crossings, bus stops and subway station entrances in the communities it serves, according to its website. Raskin, assistant director of the MTA, who came to the meeting to report on planned improvements in public transportation, got an earful from members of the audience. They said buses were not keeping their schedule and the snow pile-ups on sidewalks by the bus stops were troublesome. Raskin noted that it has been difficult to get the buses to start in the morning. He saidthe MTA is not responsible for cleaning up the snow and it is for the Department of Sanitation to deal with these issues. “It’s a rough winter, and tomorrow would be much rougher,” said Raskin, referring to blizzard predicted for the next day. “Please dial 511 or go on its website to help plan your route or check with updates. We are doing the best we can,” said Raskin. Turning to his update on planned transit improvements, he offered a progress report on constructing new elevators in more subway stops, especially the local 71st Avenue Forest Hills station, to avoid crowding on stairs and offer convenience for people with disabilities and the elderly. “We are catching up in technology. After March, several trains would be moving more efficiently,” said Raskin. 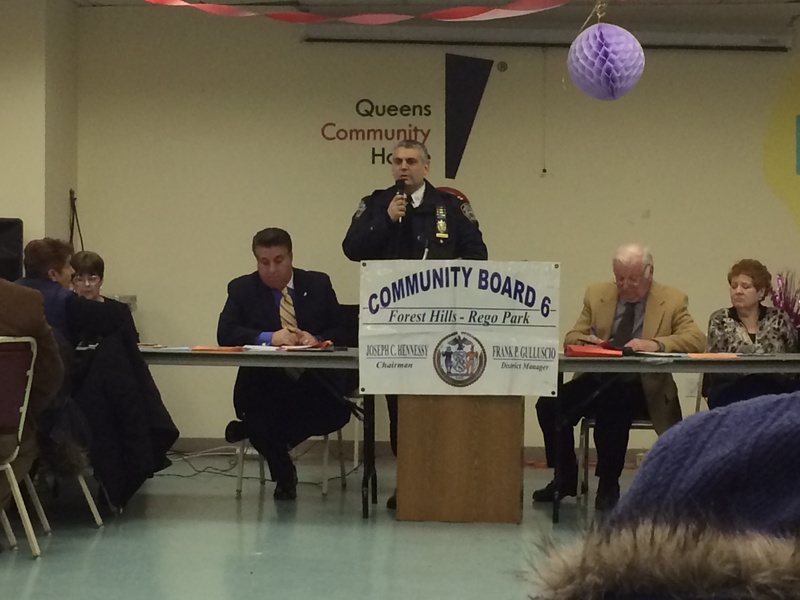 The commander of local police precinct, Queens borough president and council member all visited the community board to discuss other issues. Thomas J. Conforti, commander of 112th Precinct talked about traffic enforcement, and the educational flyers about jaywalking his officers are handing out. He acknowledged the difficulty pedestrians face when they cross from North to South on Queens Boulevard. “Our goal isn’t to penalize, but to educate.” He said. Conforti also issued burglary warnings. Consecutive burglaries have occurred in apartments off Metropolitan Avenue, he said. Suspects gain entry via thefire escapes, he said, and urged residents to lock their windows overlooking the fire escapes. 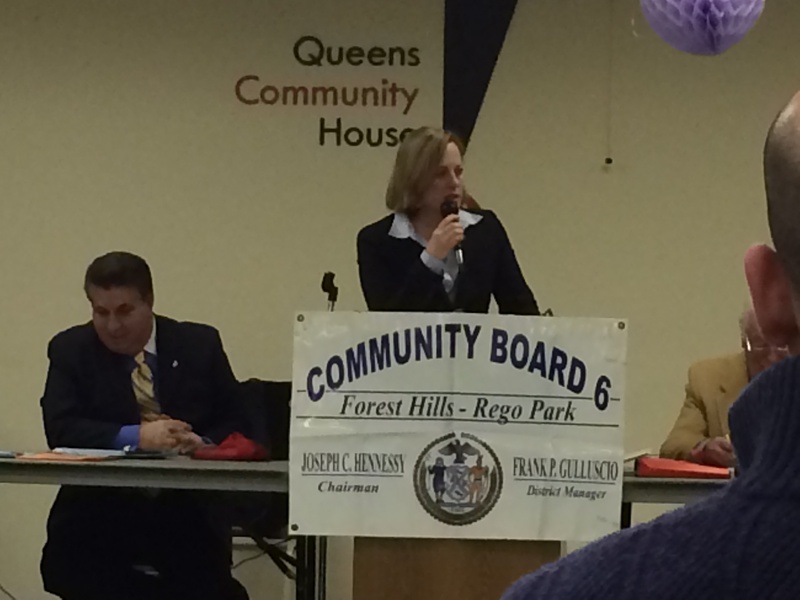 The new Queens Borough President Melinda Katz, a Forest Hills native, announced that her office is open to hearing from the public. Katz, along with Council member Karen Koslowitz, discussed Mayor Bill de Blasio’s plan to offer Universal Pre-Kindergarten. “We should give children full day pre-kindergarten and all children deserve equal advantages,” said Katz. “As a mother who experienced paying for nursery schools, UPK is a big issue,” said Koslowitz. A student of City College, Tony Lee, said that the meeting had a fair share of important and petty issues. “I didn’t expect to hear that much at a meeting in a peaceful neighborhood,” he said. As business roars during lunch hours in Asian Bowl, a local Asian Fusion restaurant right off the 67th avenue train station in Forest Hills, the staff of 10 works together to achieve one goal, to make customers happy. 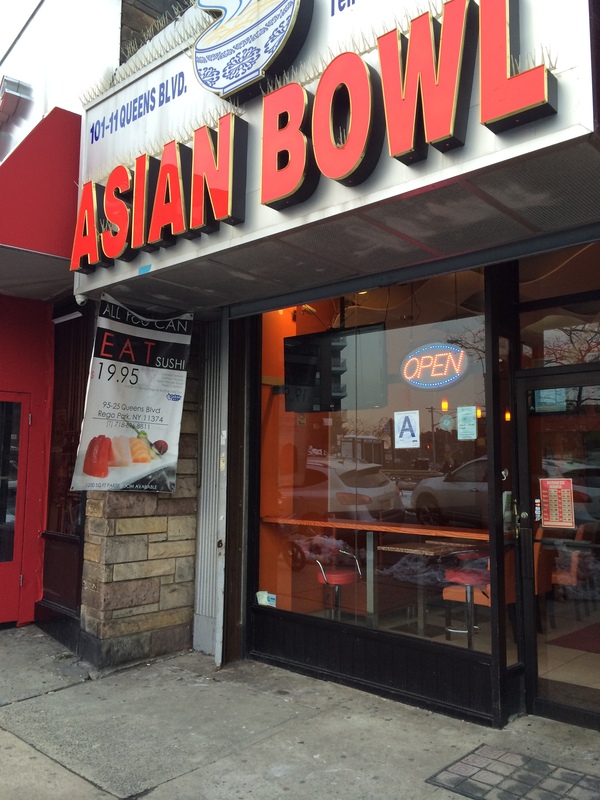 Asian Bowl is one of the few restaurants in the neighborhood that provides Asian fusion and vegetarian cuisines. Three high school best friends, Jackie Zheng and brothers Sam Chen and Chong Chen, opened the restaurant in 2011. Zheng had past business experience and initiated the idea of opening up a restaurant. He wanted to find a neighborhood that had no Asian fusion restaurants and a location near a subway stop. Zheng is in charge of inventory, making sure there is enough food and supplies. Sam Chen handles the staff meetings. And Chong Chen handles finance and paychecks. Six cashiers switch between shifts from 11 a.m. to 5 p.m. and 5 p.m. to 10 p.m. on different days of the week. Three of them are college students. Sophie Tian is a graduate student at Stony Brook University who majored in Asian American Studies. She has not found a fixed job since graduating in August of 2013 and joined Asian Bowl in order to help her uncle. Other workers at Asian Bowl include “Big Bird”, the main chef. “Big Bird” is what the staff calls him and the actual translation from his Chinese name. Jimmy, “Busboy” restocks ingredients, washes vegetables and does deliveries. The restaurant attracts local residents and hospital workers from Forest Hills Hospital. Although the staff works closely to maintain efficiency, there are days when work gets hectic.